A big thank you to Wimbledon WI for the new experiences and memories they have given me this year. At our July meeting, we had a talk about London in World War I, which led me to research a vague memory of something my mother had told me before she died. I found a photograph of her Uncle Fergus (2nd Lieutenant James Ferguson Hickson) who, researches revealed, died on the 1st day of the Battle of Passchendaele on 31 July 1917. This led me to attend two days of courses at London’s City Lit about women in World War I, as well as visits to the National Archives to find out more about Great Uncle Fergus, and onto two visits to the display of ceramic poppies at the Tower of London “Blood Swept Lands and Seas of Red”. Amazing and thought provoking to think that each of the 888,246 poppies there represents each British and the Commonwealth person who had died during the 1st World War. And we must not forget the enormous losses suffered by the deaths of people from other countries. My new experiences did not end there. 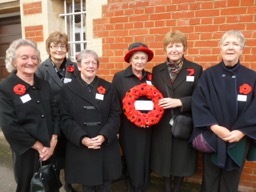 Several members of our WI had been making some wonderful poppies to raise funds for the British Legion. It was decided that for the first time in our existence, we would create a wreath from some of those poppies to be placed at Wimbledon War Memorial on Remembrance Sunday. We met before 10am in Belvedere Grove for the parade through Wimbledon High Street and onto the War Memorial. A very moving, and poignant, service was held, followed by the organizations represented laying their wreaths. 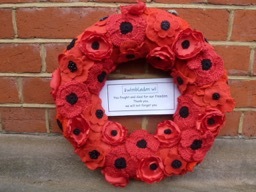 I had the great honour of being asked to lay Wimbledon WI’s wreath. I am not normally an emotional person but, as I walked up with our WI’s wreath to the War Memorial, I felt shivers running down my spine, as I thought with some considerable poignancy not only of Great Uncle Fergus but also of all the others who had lost their lives in that terrible war. I had not previously attended a parade or service on Remembrance Sunday. Thank you for encouraging me to learn more about my family’s history involvement in World War I, for encouraging me at the grand old age of 63 to finally pay my formal respects to those who died in both World Wars, and asking me to lay the wreath on behalf of our WI.